Birchfield Harriers in Birmingham have made athlete sponsorship costs known to the public on their site, asking for help to ensure a handful of athletes receive some form of sponsorship. The club don’t receive funding from UK Athletics or the National Lottery, but instead rely on membership fees and sponsors to run the club. 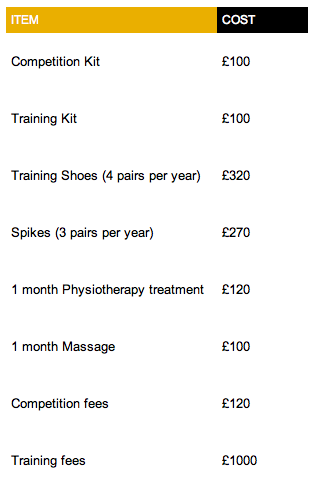 They have detailed the different ways in which you can sponsor the athletes in a shopping list format. “The cost of being a full time athlete does not come cheap”. The club is currently sponsored by major company Nike amongst others, however with the lack of financial funding for its athletes the club have turned to the Internet in hope that others are willing to help their talent athletes. Many of the athletes featured on the site receive no funding and are forced to finance their career through part-time jobs. Those interested in sponsoring an athlete will be able to meet the athlete and watch them train at a sponsors event. Not as expensive as majors, sponsorship costs are still steep ranging from the cost of kits to massages.